Grubstak is an Arizona spot with a knack for the stack. Owner Colton Grubb and chef Seth Widdes work together to create towering flavor combinations to please any palate. 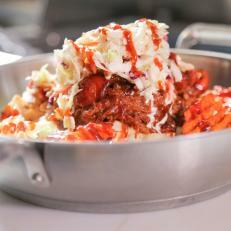 A popular pick is the Sweet Lou’s BBQ, which is a combination of shredded braised beef, applewood-smoked bacon and house-made cole slaw all piled on top of crispy sweet potato and regular fries.